Saturday night - The service will include - candles, bubbles (for the old and young), party poppers, Holy Communion and the story of God's love for people like us right back to the earliest points in time. This is one of the most amazing services of the year and it would be great to share it with many of you! 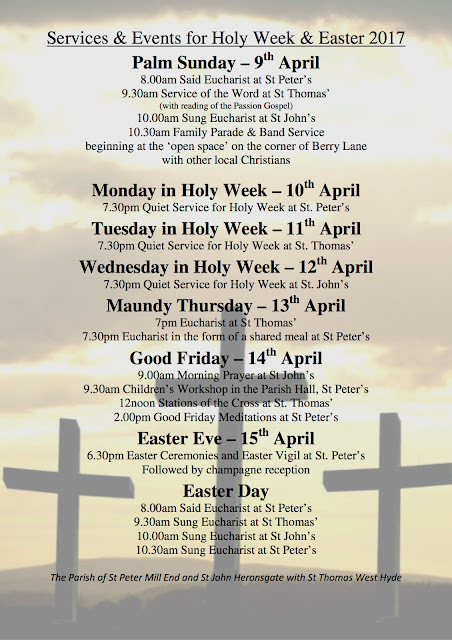 If you haven't been christened (adult or child) and you live locally and would like to be, why not come and join us for our special Easter Eve service on 15/4 at 6.30pm? If you arrive at 5.30pm and we can do some preparation with you. Please see the Facebook event page here for more details.